The cliché practically writes itself at this point: Everything is bigger in Texas. But they’re often clichés because they’re true! And when it came to #Stand4Freedom, Texas truly did it Texas-style. On Friday, April 10, IJM campus chapters from Texas A&M, Baylor, and University of Texas descended on the Capitol steps in Austin for an extra, collective #Stand4Freedom rally to cap off their individual campus efforts across the state the week prior. They were joined by other Lone Star abolitionists from Waco, Dallas, Burleson, San Antonio, Houston, College Station and Austin. Because the Texas State Legislature passed a resolution declaring Friday, April 10 as ‘Texas Ending Modern Slavery Day.’ The resolution was led by state Senator Larry Taylor and state Representative Senfronia Thompson, a longtime leader in passing laws that strengthen Texas’ human trafficking response. Texas was marking April 10 not only because they are a national leader in working to address human trafficking, but because the state’s elected leaders recognize the movement afoot – led by students, and many other citizens of faith and conscience – seeking the dramatic increase in U.S. efforts to effectively and measurably end modern slavery worldwide. And so, many from the movement came to the Capitol steps of the Lone Star State for an afternoon rally testifying to bold, bipartisan anti-slavery efforts in Texas working on the issue locally and globally. A full-throated appeal was made for the successful passage and execution of the End Modern Slavery Initiative Act (EMSI), bolstered by the delivery of over 1500 petitions signed from UT and A&M alone asking Sens. Cornyn and Cruz to cosponsor EMSI (S. 553). We will all be following up to make sure they do! Texas First Lady Cecilia Abbott gave rousing remarks on the commitment she and the Governor have for leading on this issue – and read a letter from the Governor, who as Attorney General of Texas pioneered many anti-trafficking initiatives in the state. Rep. Thompson followed with her own powerful speech on why symbols like the Texas Ending Modern Slavery Day resolution she read on the Texas Legislature floor that morning was so important – because it testifies to the real substance of the efforts in Austin and throughout the state to make a real difference in this fight. Efforts like the students and communities standing throughout Texas and this whole country to shine a light on modern slavery – and asking their elected leaders to do something about it. Something like the End Modern Slavery Initiative Act. After hearing about local opportunities like the Slave-Free City Summit from Allies Against Slavery, and how critical the work of churches and supporters to IJM’s casework in places like Ghana, the rally closed with the student leaders themselves taking the stage. Representatives from UT, Texas A&M and Baylor shared why they #Stand4Freedom, and what happens when they do. Actions taken – they handed off their letters in support of EMSI for delivery in Washington, DC, and voices raised – they demonstrated ‘unity in rivalry’ – show that ending modern slavery is something we ALL can agree on. The students led each other in the cheers from their respective campuses and the crowd enthusiastically joined in. This is a big deal! Imagine the New York Yankees and the Boston Red Sox cheering for each other. 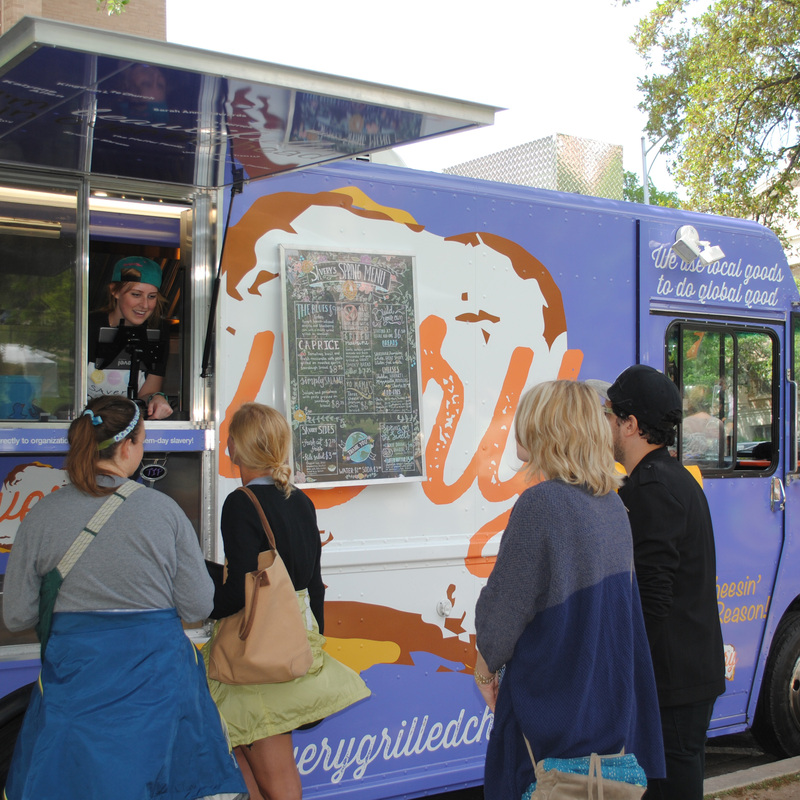 After ‘Hook ‘em Horns’, ‘Gig ‘em Aggies’, and ‘Sic ‘em Bears’ were shouted out loud and clear, the crowd walked a short distance to cap it all off with SAvery: Grilled Cheesin’ for a Reason – a food truck that donates a portion of proceeds to fighting global slavery! It was a taste of justice, and a big taste of Texas, on Friday, April 10, marking #Stand4Freedom Texas-style … and raising a big statewide flag in support of ending modern slavery. Clear eyes. Full hearts. End Modern Slavery. Forever.